Access: On the Menu bar, click Process > Processing Options..., the Processing Options pop-up appears. Click 1. Initial Processing. By default, only the General tab appears. On the bottom left, select the Advanced box to display the Calibration tab. Targeted Number of Keypoints: Allows to set up the number of keypoints extracted. Calibration: Allows to select how the camera internal and external parameters are optimized. Rematch: Allows to add more matches after the first part of the initial processing. Pre-Processing: Allows to select the pre-processing options. Export: Allows to select the outputs of step 1. Initial Processing. Allows to set up the number of keypoints to be extracted. Automatic (Default): Automatic way to select which keypoints are extracted. Custom: Allows to restrict the number of keypoints. Number of Keypoints: Maximum number of keypoints to be extracted per image. Information: When extracting the keypoints per image, an internal scoring is assigned to them. Based on this scoring, the best keypoints are selected. Allows selecting how the camera internal and external parameters are optimized. Alternative: Optimized for aerial nadir images with accurate geolocation, low texture content and relatively flat terrain, fields for example. The calibration will fail if the number of oblique images (>35 deg) in the dataset is higher than 5%. Furthermore, at least 75% of all images have to be geolocated. Accurate Geolocation and Orientation: Optimized for the project with very accurate image geolocation and orientation. This calibration method requires all images to be geolocated and oriented. Camera Optimization: This option defines which camera parameters are optimized. Internal Parameters Optimization: Defines which internal camera parameters of the camera model are optimized. All (default): Optimizes all the internal camera parameters. Small cameras such as those used with UAVs, are much more sensitive to temperature or vibrations, which affect the camera calibration. Therefore, it is recommended to select this option when processing images that were taken with such cameras. None: Does not optimize any of the internal camera parameters. It is recommended when using large cameras that are already calibrated and when these calibration parameters are used for processing. Leading: Optimizes the most important internal camera parameters. This option is used to process certain cameras such as cameras with a slow rolling shutter speed. The most important internal camera parameters for perspective lens camera models are the focal length and the first two radial distortion parameters whereas for fisheye lens camera model they are the polynomial coefficients. All Prior: Forces the optimal internal parameters to be close to the initial values. External Parameters Optimization: The position and orientation of the cameras. Defines how the external camera parameters are optimized. All (default): Optimizes the rotation and position of the camera as well as the linear rolling shutter in case the camera model follows the linear rolling shutter model.In this case, the camera model should be defined accordingly: Menu Project > Image Properties Editor... > Selected Camera Model > Edit Camera Model. None: Does not optimize any of the external camera parameters. Only enabled when Accurate Geolocation and Orientation has been selected as Calibration Method. Only recommended when the camera orientation and position are known and very accurate. Orientation: Optimizes only the orientation of the cameras. Only enabled when Accurate Geolocation and Orientation has been selected as Calibration Method. Only recommended when the camera position is known and very accurate but the orientation is not as accurate as the camera position. Internal camera parameters: The parameters of the camera model. External camera parameters: The position and orientation of the cameras. Internal camera parameters: The initial values are extracted from the camera model that has been chosen. External camera parameters: The initial values are extracted from the Automatic Aerial Triangulation (AAT) during Step 1. Initial Processing or using the geolocation and IMU when Accurate Geolocation and Orientation has been selected as Calibration Method. After step 1. Initial Processing has been completed, the optimized values for the internal and external camera parameters are saved in output files. For more information about the files generated during step 1. Initial Processing: What does the Output Params Folder contain?. The initial and optimized values for the internal camera parameters are also displayed in the Quality Report. Automatic (Default): Enables rematching only for projects with less than 500 images. Custom: Allows to select if rematch is done or not for the project. Rematch: Enables the rematch option. Automatic Sky Masking: Selected by default and only available for projects consisting of Parrot Bebop images. The Automatic Sky Masking is masking the pixels that are covered by sky on the images to avoid noise in the point cloud. 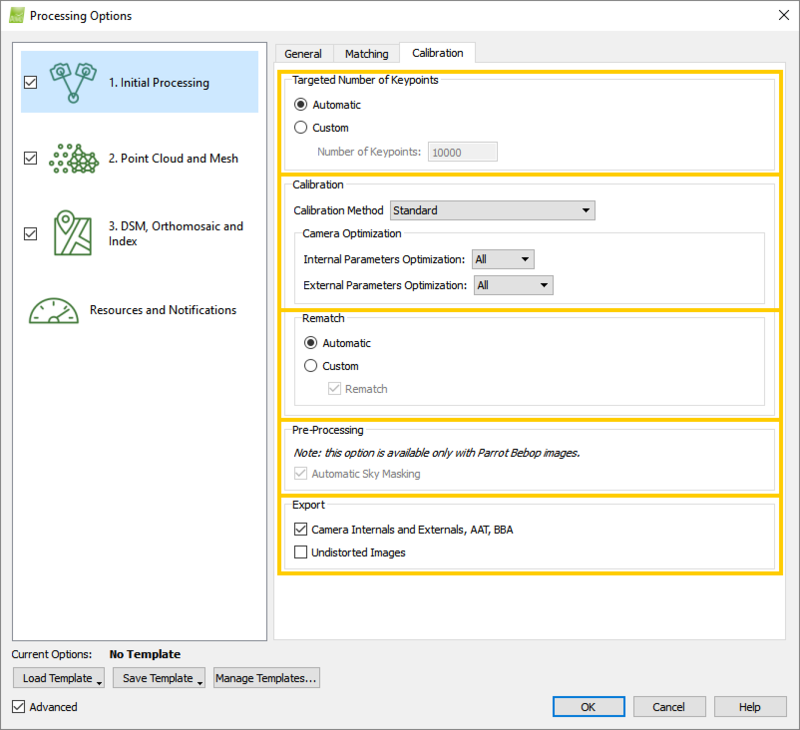 Camera Internals and Externals, AAT, BBA: When this option is selected, the results of the AAT, BBA, and optimized internal and external camera parameters are exported. Undistorted Images: When this option is selected, an undistorted copy of each original image is generated using the optimized distortion parameters of the selected camera model. Important: This feature is only available when processing images using a perspective lens camera model. If step 1. Initial Processing has already been done, it is possible to generate undistorted images without running step 1 again. For more information: Menu Process > Save Undistorted Images. Information: For more information about the camera distortions: Camera distortion. Pourquoi je n'ai pas les onglets Matching et Calibration dans la phase Initale du Traitement ?